Whenever I visit my parents in my homeplace near Tuam, I catch up with Mam’s ongoing work to research the Tuam Mother and Baby Home. I’ve seen the multiple and varied representations of the burial ground that have been published in the media over the past year, and here I try to outline what I know of the ground myself. Above ground, there seems to be little evidence as to what lies beneath. 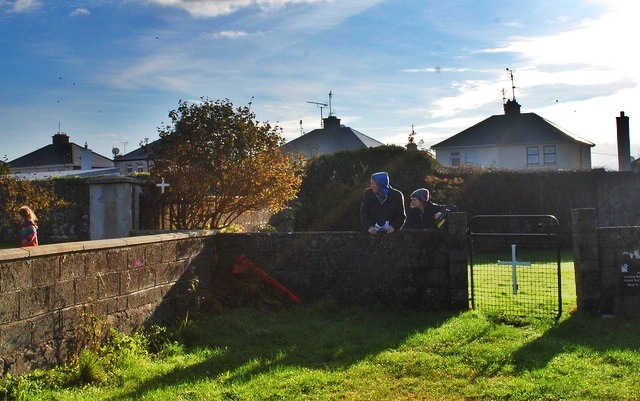 If you visit the site – and you should, to get a sense of it alongside the maps and images here – you’ll find a walled-off corner of the open space at the back of houses in the residential estate, built here after the Home was demolished. It has two gates leading into it. 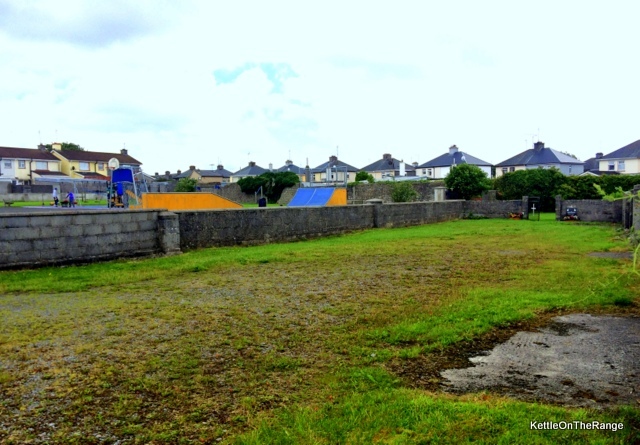 Galway County Council put the wall and the little gates there, knowing what the space was, but nothing else. The wall is arbitrary. I quake at this, because there is evidence that a significant section of the rough-surface laneway that curves around the wide open space at the back of the houses also lies over burials. 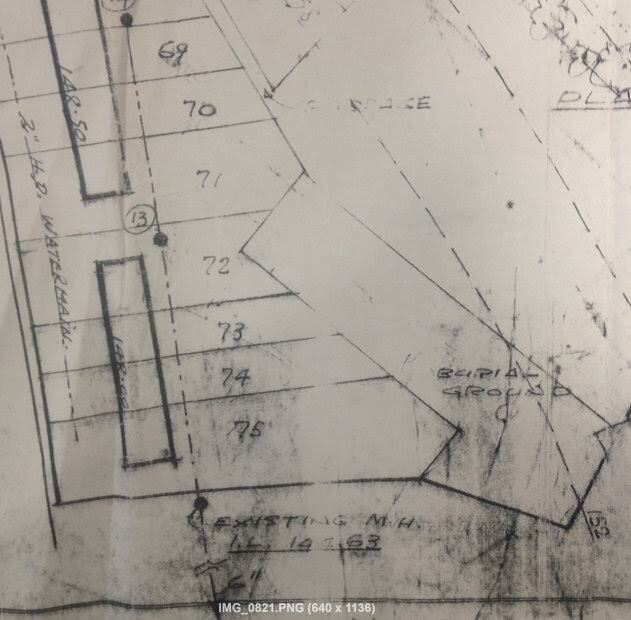 This is obvious on a 1971/72 Galway County Council planning map: the full area of the “burial ground”, as it was demarcated on the map, is clearly shown. The walled-off green plot with its plaque corresponds with a squarish projection of this. And the alignment (east-west) of the access laneway corresponds exactly with the longitudinal section. It seems that they walled off the squared end of the plot only. It was around here that Mary Moriarty, and separately, Frannie Hopkins and Barry Sweeney fell in. (Philip Boucher-Hayes gives an insightful outline of their accounts here and here.) The ground was already known for being unsteady, as sometime earlier, Mary’s niece had also fallen down through some kind of cavity in the ground here. Mam spoke to her recently, and heard she’d been clearing a spot of brambles to make a ‘kitchen’ to play in. She pulled up a root, and to her terror, the ground fell in. I personally heard Mary give her own account. She had gone to the site to investigate the source of tiny skulls brought to her attention by children playing in the area. 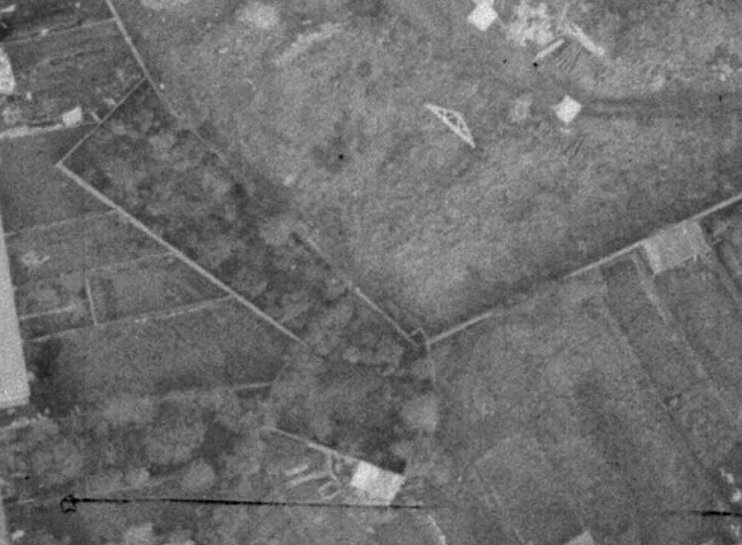 The area was not demarcated as a burial ground at this time: it was an overgrown wilderness, as you can see from the contemporary aerial photograph. This is it zoomed in to focus on the “burial ground” (compare with the maps above). 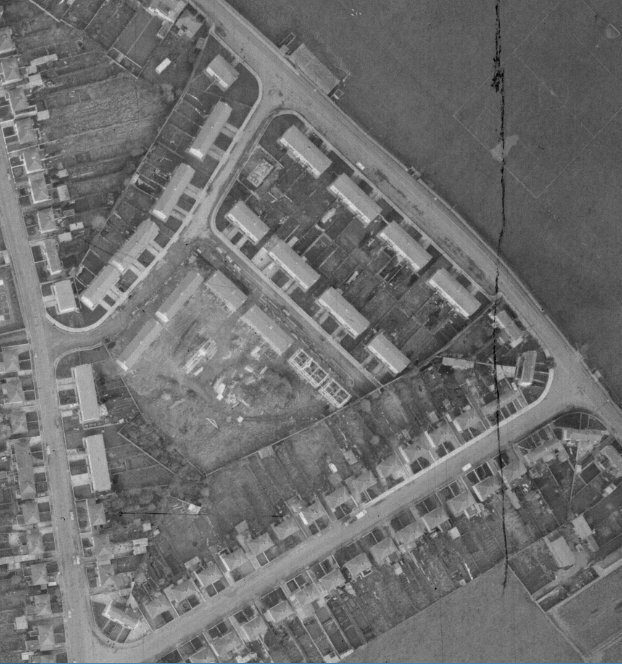 From this photograph – and of course from the archival map – it is obvious that whoever devised the building plans for the new use of the area as a residential estate made sure to avoid development of the burial ground. Gardaí came to see the site in the 1970s when Frannie Hopkins and Barry Sweeney fell in. The area was quietly covered over, and the boys were told not to play there again. When Mary fell through the ground, she saw swaddled bundles – she called them ‘parcel-eens‘: little parcels of babies, their swaddles now in rags. They they seemed to be laid in rows. It must have been a frightening, disturbing experience. Mary went and fetched her neighbour Julia Devaney, whom Mary knew had been raised in and lived much of her adult life in the Home. I feel like I know Julia, though I never met her; she died in 1985. Julia was born in 1916 and had arrived at the Home with the Bon Secours in 1925. For most of her life she effectively worked as a long-term, unpaid servant at the Home. She gave an amazingly detailed testimonial about her experience of the Home to a forward-thinking neighbour of hers in Tuam. I have read the transcriptions and from her story I form an impression of Julia as a resolute, resilient, philosophical woman. Julia wasn’t surprised about what Mary saw. She remembered that this was the space used to bury babies from the Home, and indeed told Mary that she herself had been instructed to bring them there. “Many a little one I put in there,” is what she told Mary. She’d had to enter the makeshift burial chamber by a passage that lead down steps from the back of the Home building. I imagine her, acting out her orders to walk through this dark gloomy underworld. The thought feels macabre. Well, it was macabre. Her trek to this spot was through an elaborate, disused red brick Victorian sewerage system. I can’t help but wonder about another anecdote I’ve heard, about witnesses who saw burials take place above ground. There were houses overlooking the grounds of the Mother and Baby Home, and locals could see when burials took place. It would happen at evening time, dusk. I imagine the underground chambers reconstituted somehow for oft-occurring death. When my mother told me, reading off contemporary newspaper entries, that the women (the Bon Secours nuns) charged with running the Home tendered in advance for coffins, I all but gasped. The Commissioner acting for the Committee invites Tenders for the Supply of Coffins, Plainand Mounted, in Three Sizes, to the Children’s Home, Tuam, for One Year, from 1st April 1932. Plain Coffins must be one inch thick, W.D., stained, in large, medium, and small sizes. Mounted Coffins must be of similar make and sizes, but Mounted with Electro-brassed Grips, Breastplate and Crucifix. Tenders must be lodged with the undersigned before 4 o’clock, p.m., on Monday, 8th February, 1932. It feels like deathly efficient forward-planning. Mary saw no coffins. Mam spoke to two men whose fathers won the tenders for providing coffins, a Mr Fahy and a Mr Dwyer. They were local carpenters, and they did make coffins for the Home, but certainly not in the quantities that we know would have been required. According to Mam, the coffins provided were simple boxes, lined with a white sheet. I wonder if the coffins were used for older children, and the swaddles for infants. And I make a guess. 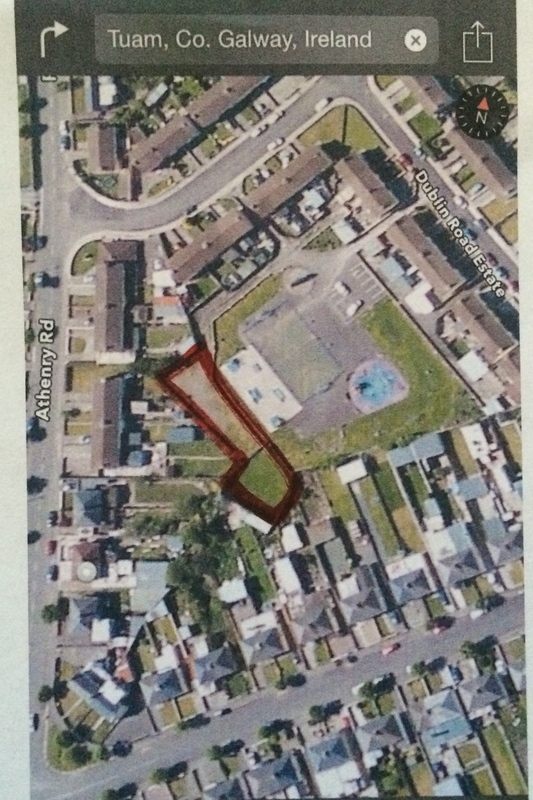 Did they inter the infants in the underground tunnel system, and secretively, in fading light, bury older children in the longer strip of ground – the area that is not even afforded a boundary wall now, but which is treated as a laneway? When information about the extended area became known last year, media reports claimed it was a ‘second’ graveyard. 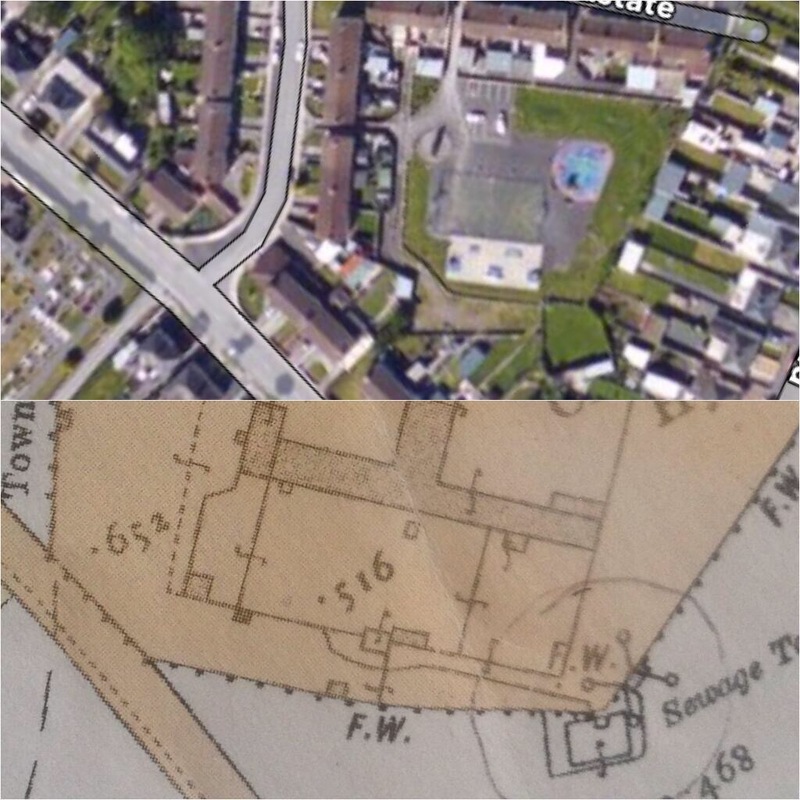 But on the archival map drawing, the two sections are both part of the same demarcation for burial ground. The long section is not now enclosed, and it has since transmogrified into a laneway, shown in the photo above. The gated entrance to the much smaller section, the enclosed area we’ve been hearing all about since last June, is visible in the background. Information sourced (see article by Conal O Faharta) regarding infant mortality, falsified death certificates and child trafficking at the Tuam and at Bessborough Mother and Baby Homes was so shocking, that already in 2012, before any of Mam’s research made headlines, the HSE made recommendation that “a fully fledged, fully resourced forensic investigation and State inquiry” be launched. A state inquiry is underway by now, and a full forensic investigation is the only way to definitively explain the exact nature of and extent of burial. This entry was posted in Tuam Babies and tagged burial ground, Galway County Council, Julia Devaney, Tuam Herald. Bookmark the permalink. Exhumation is the only way to get answers to what really lies beneath. Then, just maybe my mother would know what happened to her child. When will someone do the decent thing and order an exhumation? The families won’t go away and won’t rest until the truth is known. Thanks for your comment Annette. Courage and strength to the families in their endeavours to keep uncovering the truth. This calls for reblogging. It is a matter of national shame that powerful elements of the press are so embedded with vested interests that they have attempted to shut down this shocking story of how we treated our infants in the past, while PR shills claim that truth-tellers are “losing the run of themselves”. I write from a place of emotional violence. The emotional violence is born from how we suppress ourselves and our past in the face of raw power. Thank you Adrienne for this beautiful worded piece on those dark days. It is time for the church and state to come out and admit that this happened and get on with the task of trying to right the wrong of a lifetime of punishment metered out to children and mothers that were totally innocent of any crime. Exhumation is the only answer to find out who those bodies are and also to give them a dignified burial they so richly deserve. My sister is also missing and is possibly down there. I have a birth record and a death record for her and no body. Somebody knows or there is information somewhere as to her whereabouts. Catherine Corless has done so much for all of us that has such horrible memories of the Tuam Mother and Baby Home and also for those that has family members missing. My mother also spent most of her life in The Magdalene Launderies, a punishment for being a single mother. A life time sentence for murder nowadays is no more than 20 years. My mother brought a life into the world and got 35 years. Where is the justice in that? Thanks for your comment Peter and also for your own beautiful and hard-hitting words. Courage and strength to you for speaking up for the mothers and children, now adults, for what they went through. Keep telling the stories, keep uncovering the truths. In the Angel’s Plot in Castlepollard, the babies were buried in shoeboxes which was common enough in old Ireland. Very thoughtful and informative piece. Trojon work. Do you know if the site was ever legally constituted as a burial ground? I understand there are Acts of Parliament requiring places of burial to be properly regulated. Did the nuns have a morgue? Or did they send dead children to an external one and then return them for burial? Was there independent oversight of death certificates? Some of the links in your piece have helped a lot with my questions. In Australia, there are many stories from people who were children in institutions of children being buried in the institutions grounds, and even stories of healthy children disappearing, with late night burials occurring upon their disappearance. Some have gone as far to sledge that the nuns murdered children. I just thought these were the minds of traumatised kids trying to construct some way of dealing with the sudden and unannounced disappearance of children from the orphanage when they went to a foster home. Spooky to think these things may have happened.